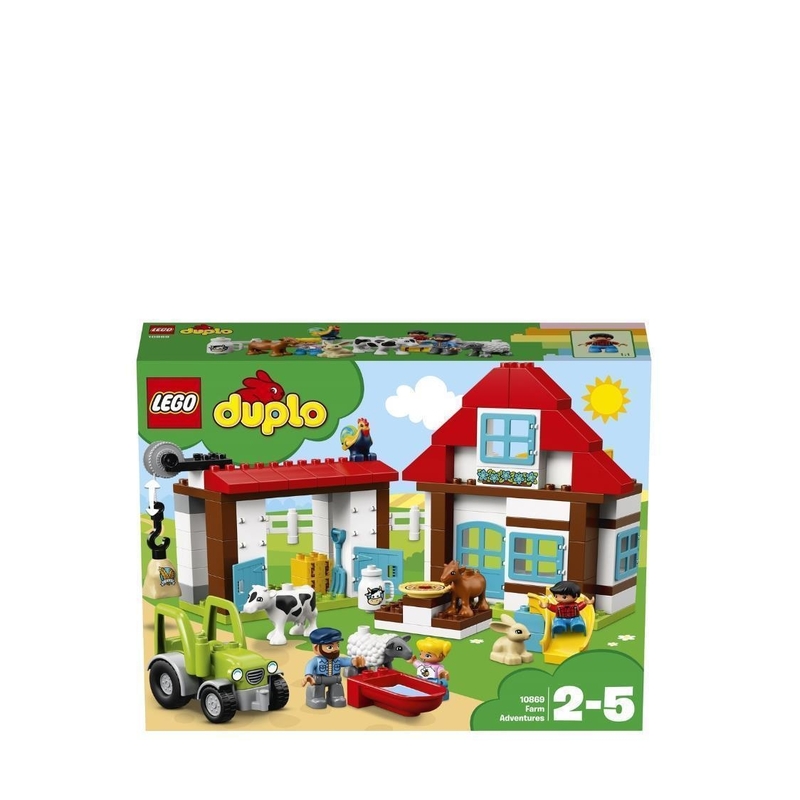 - Includes 3 LEGO® DUPLO® figures: a farmer and 2 children, plus 5 animal figures: a sheep, cow, goat, rooster and a rabbit. - Features a farmhouse with an upstairs bedroom and toilet, barn with a bell and string function to make it go up and down, tractor, picnic bench and a slide. - Accessory elements include waffles, a trough, milk bottle, hay brick and a pitchfork. - Play out a visit to the adventure farm with this great learning toy for toddlers. - Talk with your preschool child about the different animals they meet there, what they eat and what noises they make. - Use the modern characters, accessories and decorated bricks to have fun while helping your toddler learn about caring for animals in a farmyard setting with this versatile toy. 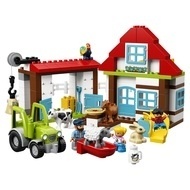 - Help your child master basic construction skills with this easy-to-build model. - Combine with the 10867 Farmers' Market, 10868 Farm Pony Stable and 10870 Farm Animals for more fun on the farm. - Farmhouse measures over 9” (25cm) high, 8” (22cm) wide and 3” (9cm) deep. - Barn measures over 6” (16cm) high, 7” (19cm) wide and 3” (9cm) deep. - Tractor measures over 3” (8cm) high, 3” (10cm) long and 2” (7cm) wide.